In Japanese culture, the number 42 is considered unlucky because the numerals when pronounced separately—shi ni (four two)—sound like the word "death". There are 42 questions asked of persons making their journey through Death. Ma'at, a female personification, considered to be both maternal and a delivering force, is an Ancient Egyptian personification of physical and moral law, order, and truth. In the judgment scene described in the Egyptian and the Book of Pass [the Book of the Dead (which evolved from the Coffin Texts and the Pyramid Texts)], there are 42 questions personifying the analysis of Ma'at. If the departed reasonably can give answers to the 42 questions, they have the potential to either be reincarnate, or if completely successful, reach the ultimate goal of becoming a Star, whereon, they can continue to give Light, and fuel Universal growth. The number 42 is, in The Hitchhiker's Guide to the Galaxy by Douglas Adams, " Answer to the Ultimate Question of Life, the Universe, and Everything," calculated by an enormous supercomputer named Deep Thought over a period of 7.5 million years. Unfortunately, no one knows what the question is. Thus, to calculate the Ultimate Question, a special computer the size of a small planet was built from organic components and named "Earth." The Ultimate Question "What do you get when you multiply six by nine?" was found by Arthur Dent in the second book of the series, "The restaurant at the end of the Universe." This appeared first in the radio play and later in the novelization of The Hitchhiker's Guide to the Galaxy. The fact that Adams named the episodes of the radio play "fits," the same archaic title for a chapter or section used by Lewis Carroll in "The Hunting of the Snark," suggests that Adams was influenced by Carroll's fascination with and frequent use of the number . The fourth book in the series, the novel So Long, and Thanks for All the Fish, contains 42 chapters. According to the novel Mostly Harmless, 42 is the street address of Stavromula Beta. In 1994 Adams created the 42 Puzzle, a game based on the number 42. The 2011 book 42: Douglas Adams' Amazingly Accurate Answer to Life, the Universe and Everything examines Adams' choice of the number 42 and also contains a compendium of some instances of the number in science, popular culture, and humor. 42 Minutes (podcast): Douglas Bolles and William Morgan host a lively weekly conversation in which they naturally discuss "the answer to the ultimate question of life, the universe, and everything" with the interesting authors, thinkers, syncers and philosophers of our day. The show has its genesis in a series of discussions regarding The Sync Book, of which, both hosts are authors. "In keeping with your motif of Colorado and the Trinidad train-car accident, I notice that you did not post about this death last May 28 in Colorado, which occurred on the Royal Gorge Scenic Railroad about 100 miles NNW of Trinidad, Colorado," notes Tom Mellet. "Train conductor's death devastating: 'Our hearts are broken'" CNN, May 29, 2016. 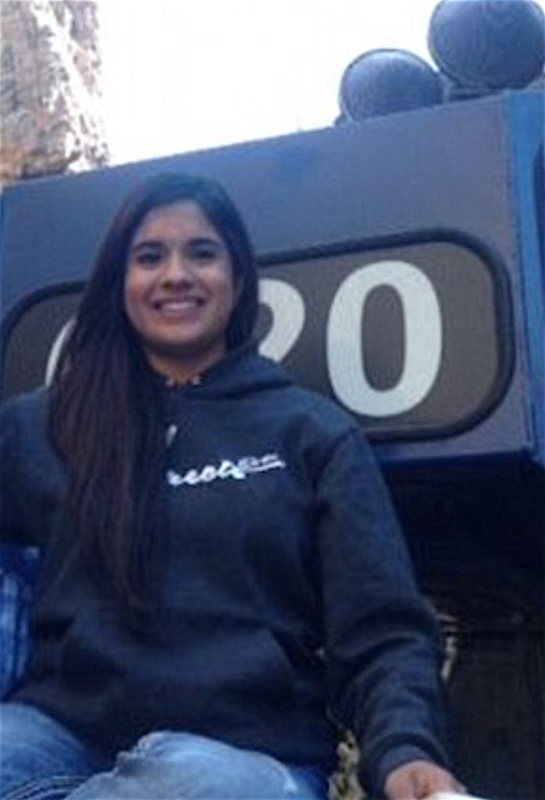 "Leslie Cacy, 28, fell off the back of the Royal Gorge Railroad train at around 5.30pm on Saturday [May 28, 2016] - just minutes before the end of her shift - and died instantly when she was run over," reports the Daily Mail. 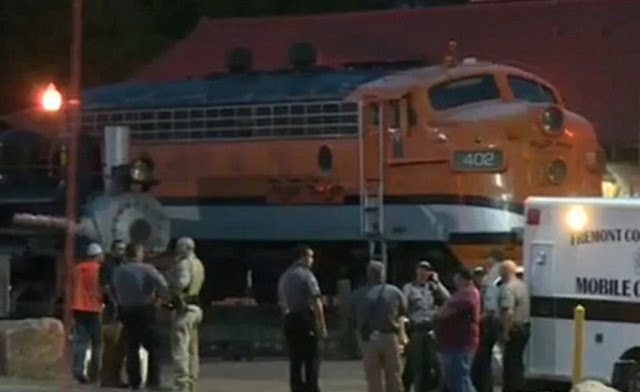 Locomotive #402 becomes 42, as numerologists drop the zeroes in their analyses. Passenger Cynthia Brier told of seeing the train's engineer in a state of shock shortly after tragedy struck. The train's number was 402. See Trinidad 33. Especially read the long comments sent in by the readers. For other Trinidad, Colorado accidents, see here. 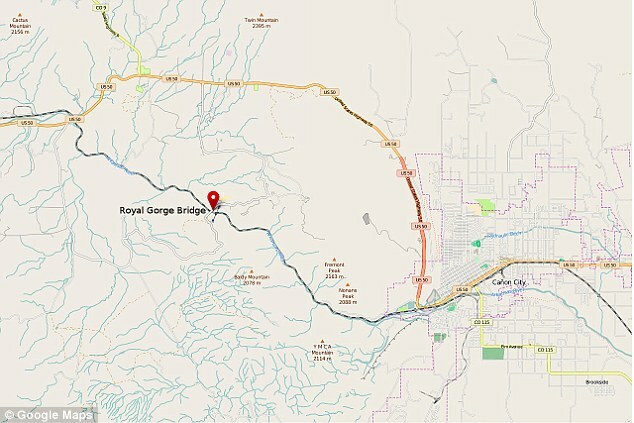 The history of the Royal Gorge route, which was revived in 1998, can be found here.